gmSCAN ™ is a Magnetic Induction scanner for the automatic classification of pig carcasses (SEUROP). The scanner also predicts the percentage of lean and the weight of the primal cuts including ham, bacon, loin, and shoulder. gmSCAN ™ analyses the pig carcass in a vertical position and therefore its installation does not require modification of the slaughter line. 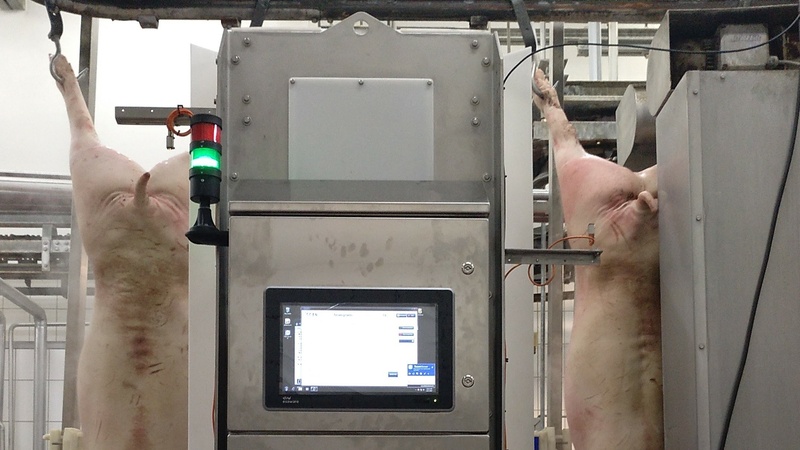 The response of the scanner is proportional to the lean content and is independent of the breed or genetic variations of the pig. Thanks to this characteristic, gmSCAN ™ is a very robust, accurate and reliable classification system, particularly when working with different populations of pigs. The measurement technique is based on the generation of a variable magnetic field of low intensity and the measurement of the perturbation of said magnetic field due to the passage of a pig carcass. In a certain range of frequencies, it is possible to determine lean content due to differences in the dielectric properties of bone and fat with respect to the lean tissue. gmSCAN ™ is a technology that has been developed in collaboration with gmSTEEL and has been certified by gmSTEEL in Spain and Poland. Lenz Instruments is the distributor of this classification system in Spain.